It was sad news this morning when I awoke to hear Rue McClanahan had passed away very early in the morning hours today. Rue is best known for her role as Blanche Devereaux on the television series Golden Girls. Hard to believe now, but at the time the show was very controversial for its depicting an older generation of women as being sexually active, and the character Blanche was the most hot-to-trot of the four women in the cast. Rue started appearing in film and television roles in the early 1960’s and had become a staple on television since the 1970s where she joined Bea Arthur on Maude as Vivian Harmon. She later became a regular for first season of Mama’s Family which was spun off of the Carol Burnett Show before Rue landed the role she would most be recognized for. Initially the producers of the show wanted Rue for the role of Rose as the character was similar to the one she played in Maude. Betty White was originally courted for the role of Blanche as it was very similar to her role as Sue Ann Nivans in the legendary Mary Tyler Moore Show. Fortunately, Rue and Betty weren’t interested in retreading characters similar to what they’ve done in the past and swapped the roles and the show and the show became legendary reaching audiences well outside of just the older crowd. 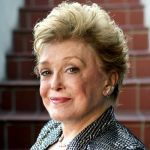 More recently Rue McClanahan was asked by Del Shores to come play the role of Peggy Ingram in Sordid Lives: The Series. The series takes place before the events of the popular Sordid Lives movie, which was filmed several years earlier. Rue’s costars on Sordid Lives included Leslie Jordan, Olivia Newton-John, and Caroline Rhea. The series appeared on the Logo Network and due to funding issues with the network a second season has been on hold from starting production. In any case, Rue will be greatly missed, but her work will live on through the ever popular reruns of the Golden Girls in particular and the availability of much of her work on DVD. Betty White is now the last Golden Girl remaining and has seen a revival in popularity including a campaign earlier this year to get her to host Saturday Night Live, which she did the weekend of Mother’s Day. I feel sad and wanted to salute Rue because Golden Girls was always a show that I watched with my Grandmother and it has a special place in my heart for memories of my grandmother. Thanks for finding my blog. I agree Rue was a very special lady and I will treasure my memories of her roles on television. She was definitely my favorite. I still watch her shows and love them all. Thanks for sharing your tribute to her.